I’m going to call this a PREview, rather than a REview. I’m doing so mainly because this pack is a creation that I’ve been involved with from the start. I probably have more of a subjective opinion on it than an independent reviewer! 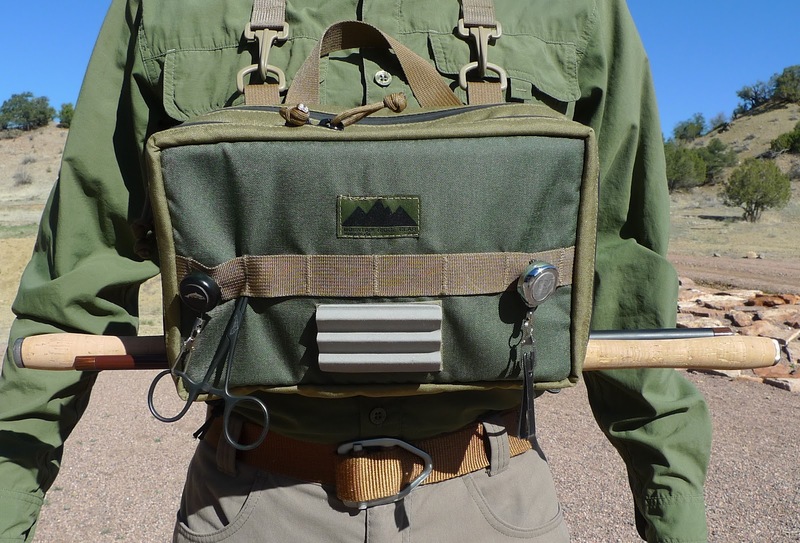 The Fishin’ Buddy is being produced by Mountain Ridge Gear in Colorado Springs, Colorado. Mountain Ridge Gear owner, Eric Lynn, and I have a long history of backpacking and fishing the backcountry together. Several years ago we hatched the idea of a lightweight, simple, versatile fishing pack that could be used both with and without a backpack, and that would be manufactured in the US. 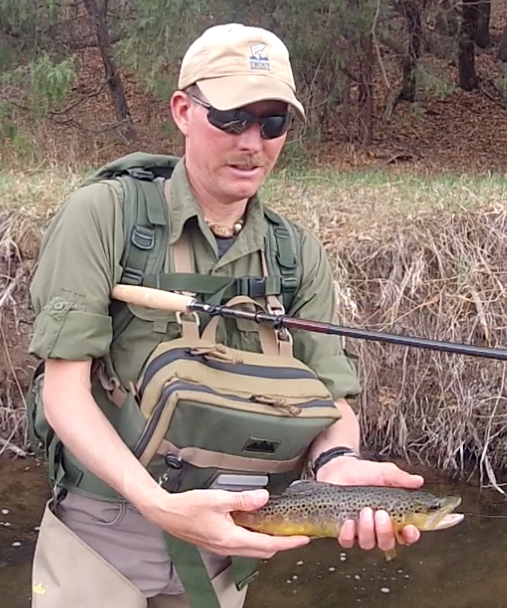 Our initial discussion was held on the banks of a tiny trout-filled stream in the central Colorado wilderness. I remember sitting there thinking that the small nylon pouch hanging from a lanyard around my neck, safety-pinned to my shirt, was a beginning, but that we could design something that could do so much more. Eric had been on his own quest for such a pack, so we put our heads together and started talking. After countless trail miles, dozens of campfire discussions, and lots of trout later…fast forward to deep winter in February 2012. Eric and I had skied up a snowed-in two-track, hauling pulks loaded down for a few days of winter camping. While we sat around the wood stove, sipping Jamesons and listening to snow sift onto the tent, we decided to kick the Fishin’ Buddy project into high gear. What you see here is the product of all of that planning, design, and on-the-water testing. We think we have a fishing pack that has everything you need and nothing you don’t. The Fishin' Buddy is completely compatable with any full-sized backpack or day pack. Shown here with a Kifaru Spike Camp backpack (2,300 c.i.). Worn as a chest pack, the cross harness is very secure. 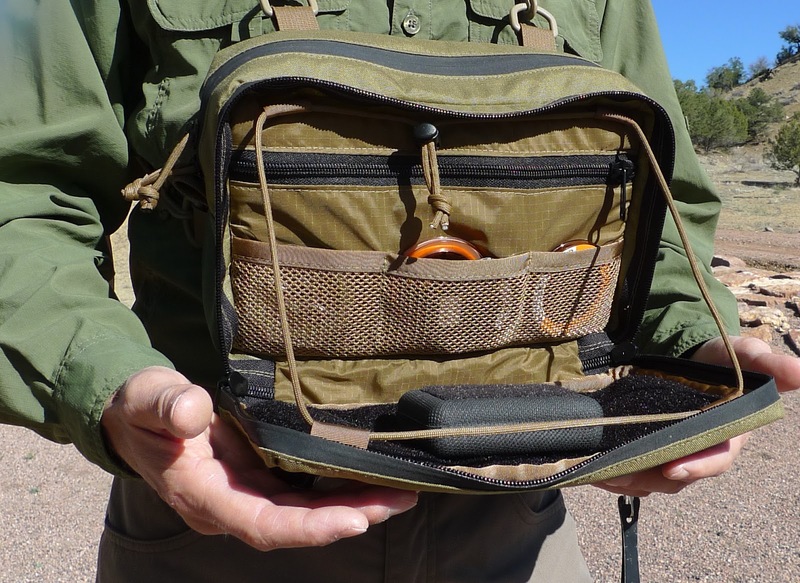 The Fishin' Buddy is a very versatile pack. Show here worn as a lumbar pack, using the integrated, hidden waist belt. A fold-out hook-and-loop panel on the front of the pack makes organizing flies and fly boxes easy. It's completely adjustable with the paracord/cord lock system. The front compartment also features mesh tippet pockets and handy, zippered storage. The inside front panel is show here with a Simms Patch fly box, which can be mounted inside or on the hook-and-loop fly patch on the outside of the pack. The roomy main compartment can hold a variety of larger items such as fly boxes, line spools, tippet, camera, small water bottle, snacks, etc. Both compartments feature waterproof zippers. Although not designed specifically for tenkara anglers, the design of the pack is very "tenkara-friendly". Two loops on the bottom of the pack allow up to two tenkara rods to be stowed and carried there while hiking. This is especially handy when fishing on the go while carrying a backpack. Simply pull your rod off the bottom of the pack, deploy it, and start fishing! Shown with my 11' Iwana and 13'6" Amago, both produced by Tenkara USA. There's also a bungee cord on the bottom so you can stash a shell or windshirt. Streamside tools are easily attached to the front of the pack, using the military-inspired MOLLE webbing. This keeps them handy, and doesn't poke holes in the fabric of the pack. A handy hook-and-loop fly patch on the front easily accomodates a ripple foam fly patch or a fly box like my Simms. Mountain Ridge Gear will have these versatile, lightweight, minimalist packs up on their website in the next few days. They're made right here in Colorado, USA, by a veteran-owned small business. As co-designer, I realize I'm biased, but I think this one's a winner! Dimensions (stuffed): 10.75" x 6" x 7"
Retail Price: Check Mountain Ridge Gear's website soon! I'm confused, isn't the entire point of tenkara its being minimalist? Nothing against your bag in a normal fly fishing situation, but you look like a geared up paratrooper with the kitchen sink in front. It doesn't eeve look like you have freedom for proper arm movement-- just MY thoughts. Well, we also designed a Fishin' Buddy Jr., which is a more minimalist pack. Yes, tenkara is minimalist in nature. However, I consider tenkara a "normal fly fishing" situation. As for "proper" arm movement, it's there with this pack. Both Eric and I tested the pack over many months in real-world conditions. If it limited arm movement, we would not have offered it for sale. Use it with confidence if it fits your fishing style. If not, there are plenty of alternatives.